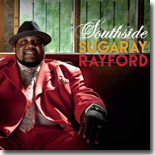 San Diego singer Sugaray Rayford continues to build on his relatively nascent recording career, with the great Southside being this month's Pick Hit. Two of our reviewers raved about the excellent Stony Plain session featuring James Burton, Albert Lee, Amos Garrett & David Wilcox, with the appropriately-named Guitar Heroes coming in as this month's Surprise pick. We look back at some very good 1967 live recordings from John Mayall's Bluesbreaksers in our Flashback feature. Our What's New section features reviews of new CDs from Sherwood Fleming, Jackie Payne, Amy Black, Ian Siegal, Cash Box Kings, Cedric Burnside Project, Mr. Sipp, Steve Dawson, Robin McKelle, Ghost Town Blues Band, Deb Ryder, and more.